I have a confession to make. I cook separate dinners for my children, and I feel shameful admitting it. Yes I know, I shouldn’t be a short order chef. But here is the problem. My children do not yet like eating curried coconut lentils and spicy enchilada soup. And while my husband and I are prepared to compromise somewhat on our dinner choices, we still like to eat certain foods that the kids don’t yet appreciate. The result is that, most nights, I make a separate meal for my children. But recently, we made a pact. Three nights a week we will all eat the same meal. 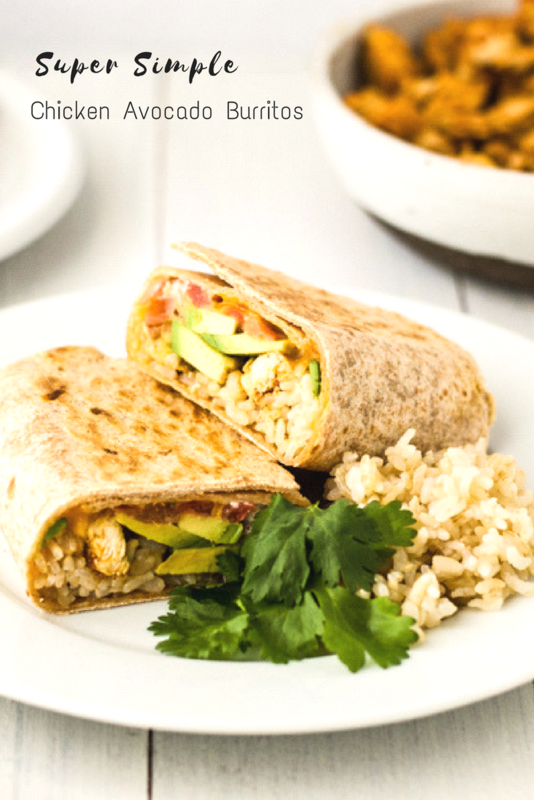 So I’ve been coming up with a list of “whole family recipes”, and these super simple chicken avocado burritos are on it. 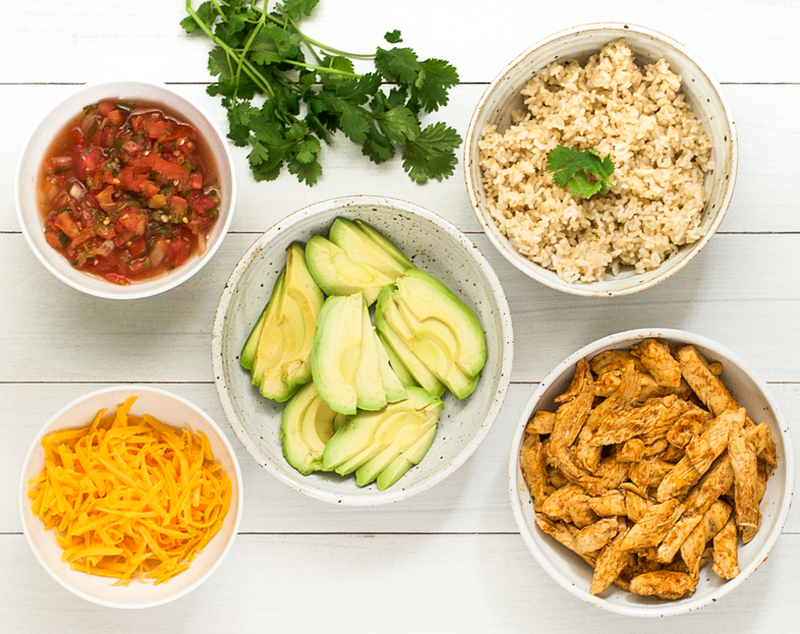 These burritos can be assembled in no time at all because they are made with pre-cooked chicken. You just sauté the chicken with some taco seasoning, either homemade or store bought. Then you throw it into a whole wheat tortilla with avocado, salsa, cheese, and yogurt. Roll it up, fry it in a dry pan for 2 minutes a side, and serve. The result is a delicious, healthy family meal. And you can customize them for different tastes. Like your burritos spicy? Add some jalapeños. Feeling extra hungry? Add some brown rice. The other good thing about these chicken avocado burritos is that you can assemble them in advance. Then, when you are ready to eat, just pop them in a pan to warm them up. If you need help with rolling the burritos, check out this great explanation from The Huffington Post. 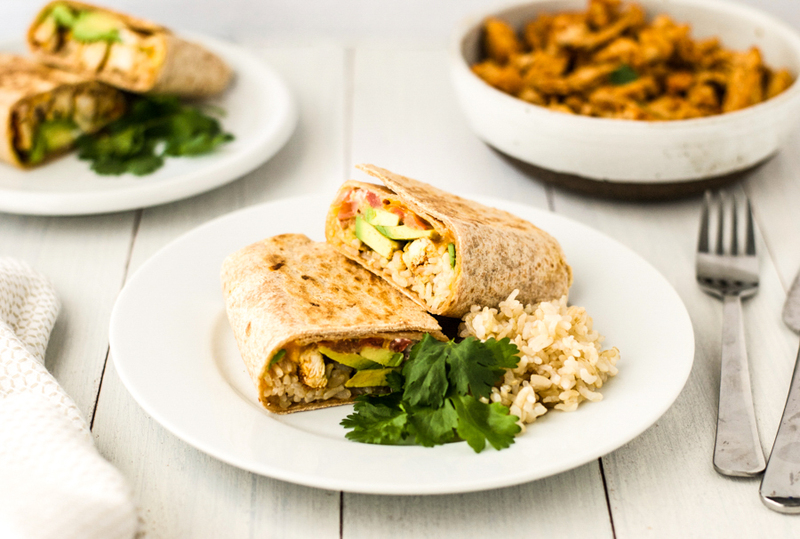 These chicken avocado burritos can be assembled in no time, and are completely customizable to keep everyone in the family happy. In a large skillet, heat the olive oil over a medium heat. Add the chicken, taco seasoning and 3 tbsp water. Saute for about 5 minutes, or until chicken is warmed through. Place 1 tortilla on a flat surface. Add 4 small pieces of chicken, 3 slices of avocado, 1 tbsp each of cheese and salsa, and any other fillings you want. Be mindful not to fill the burrito too full, or you won't be able to close it. Roll the burrito (for help, see the link above). Place a skillet over a medium low heat. Add the burritos and cook for about 2 minutes on each side, until lightly toasted. Holy delish. Truly contemplating a second lunch after seeing this good lookin’ thing! Cannot wait to try these! OMG these look delicious! I am a burrito bestie, and these look like a fine specimen. I love the simplicity and the inclusion of avocado!